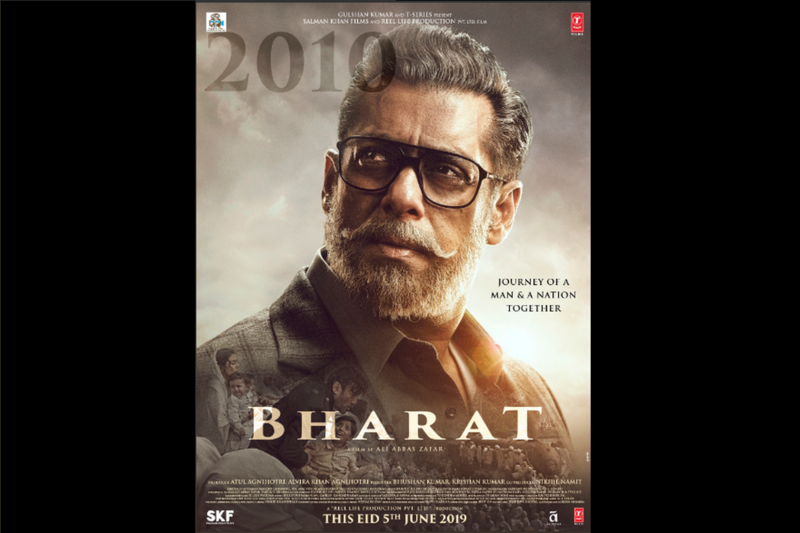 The much awaited Bharat first look poster is out. The Salman Khan starrer helmed by Ali Abbas Zafar is set for Eid release and has Katrina Kaif, Tabu, Disha Patani and Jackie Shroff in pivotal roles. The makers of the film shared the Bharat first look on social media. Within an hour of its release, Salman Khan’s new look caused a social media frenzy, with fans cheering the actor sporting salt and pepper hair. Starring him in the lead, the film shows an aged Khan in spectacles looking meditative. In warm shades of brown and grey-black, the poster also gives a glimpse of his serious character. Khan had undergone multiple look changes as the timeline of the film spans from the 60s to contemporary times. Salman’s look also reminds one of Jackie Shroff’s recent sporting looks from films like Romeo Akbar Walter (RAW). On the chequered suit that Khan is wearing is also a glimpse into what looks like a flashback of his life, from a child to a young man. Katrina Kaif also, only recently, shared a glimpse of her character from the film on her Instagram. A screenshot of film footage shows her smiling in what looks like a green sari, with only a black bindi as accessory. The film’s trailer will be released on April 26 2019, when Avengers: Endgame hit the theatres across the country.